Wasabi was seen a bit over a week ago, looking very healthy. Although it was nearly two months since he was last seen, he wasn't interested in visiting the humans. The reason for this soon became apparent. 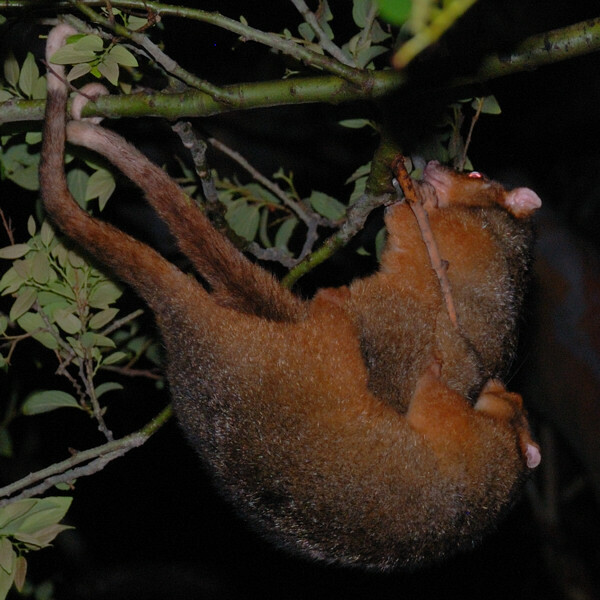 By the way, this is the first time we've seen ringtails mating. I'm not sure who the female ringtail is, although she's probably not Tilda. 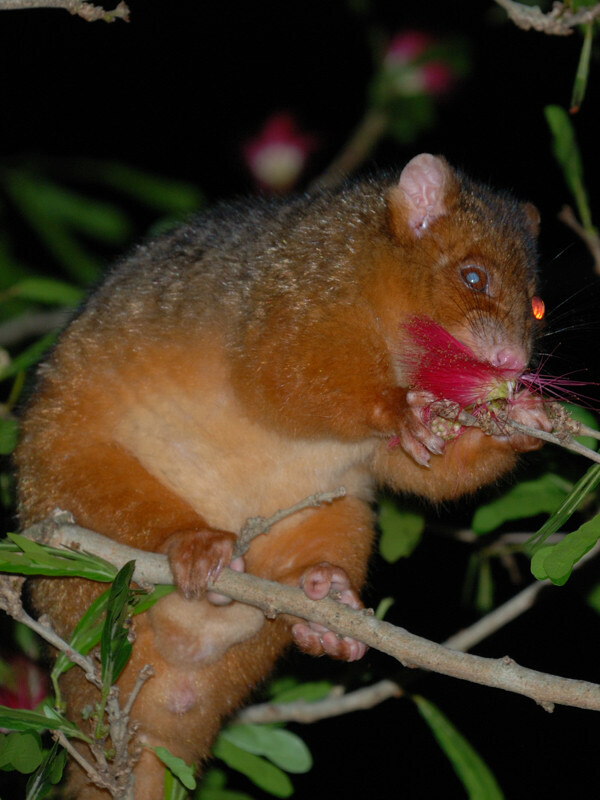 Meanwhile, the visiting male brushtail, mentioned last time, slept in Box 4 again. I saw through the box camera that he appeared to have a small but nasty circular wound on his head, and another on his neck. I took his photo when he left the box (from a considerable distance; the picture is zoomed in as far as it will go), and at first sight it seemed he had a marble glued to his forehead. It took me a little while to realise that it was a very large paralysis tick. I have never seen a possum in this area with ticks before, although they're supposedly very common. Fortunately, native animals are generally immune to the paralysing toxins produced by this tick, but I'm sure it can't be fun to have a couple of these massive suckers hanging off your face. 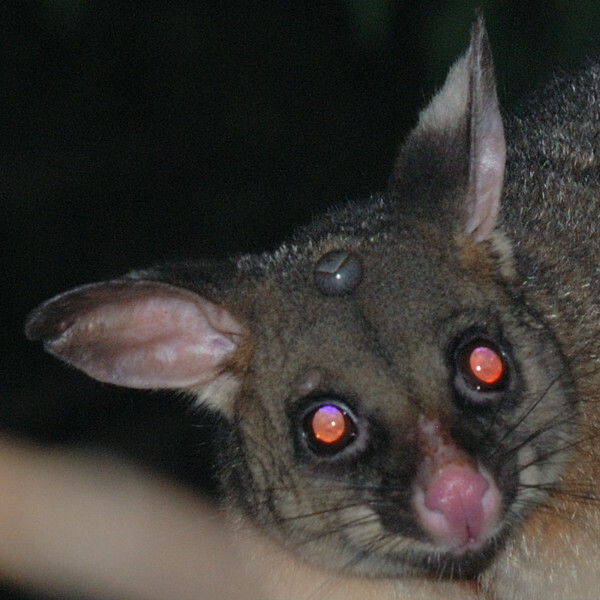 It could be worse though; Northern Rivers Dreaming frequently find ticks in their possum's eyes. Which can be particularly scary when you've got a possum who has only one eye to begin with. Meanwhile, Kiki and Comet are doing fine and visiting regularly. Comet has bitten his first toe and has entered the house on his own several times. 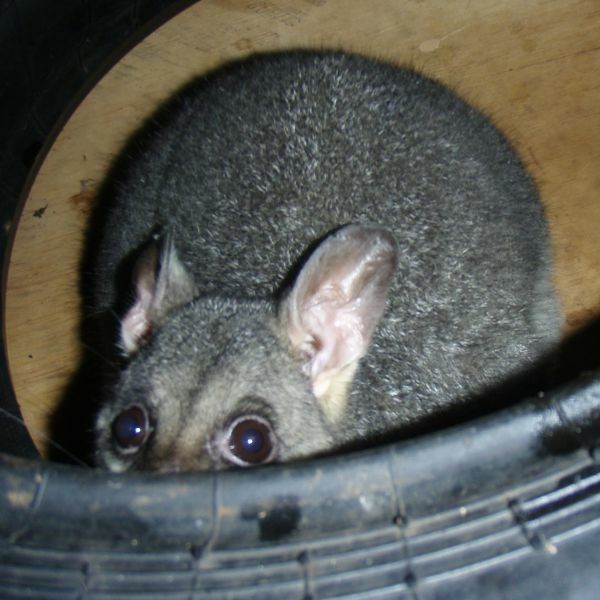 Neither have been sleeping in any of the possum boxes, although Kiki slept in a stack of car tyres in the garage one day recently. Great to see Wasabi. We were just thinking of him the other day. Mr Suitor has turned up with a very bad eye injury so we may well end up with two one eyed possums (we haven't seen One Eyed Puss for a couple of weeks but fingers crossed he's fine). We're just at that dithering stage with Mr S that you'd know well as to whether he needs a vet trip. We're giving him a couple of days to see how the eye recovers. PS: God we HATE ticks!!! Bad news about Mr Suitor, but hoping it's not as bad as it seems. Queek had what appeared to be a terrible eye injury (see http://blog.possum.tv/2013/11/poked-in-eye.html), but got over it without a vet visit (he was given oral antibiotics and eye drops, but it's quite likely these weren't really needed). The first thing we did when Mr S turned up with a bad eye was reread that post of yours. Thank you. It's such a good reference tool to have.